Green onions, sometimes referred to as spring onions or Chinese onions, are typically seen as final adornments on the dishes we love. We may toss them on top of scrambled eggs with cheese for a bit of sharp contrast in both taste and color, sprinkle them over our attempt at beef stir-fry, or use them as finishing touches in our other culinary creations. Green onions are full of antioxidants that help combat free radicals that can damage your cellular tissues. They also have vitamin C, which keeps your cholesterol and blood pressure in check, leading to a lower risk for heart disease. With vitamin C and vitamin K, green onions are great for keeping your bones strong. Vitamin C produces collagen, which is responsible for strong bones, and vitamin K keeps the density of your bones strong. Speaking of collagen production, your skin needs that to stay youthful and beautiful. Green onions naturally help your body to keep producing collagen so your skin can rejuvenate naturally. Green onions are revered for their antibacterial and antiviral elements. They are fantastic fighters for the flu, viral infections, and pesky colds. That is because they naturally stimulate the respiratory system to remove mucus. Filled with carotenoids, including lutein, green onions are beneficial for keeping your eyes healthy. They also contain vitamin A, which keeps your vision normal, as well as protects your eyes from inflammation and degeneration so you have less chance of losing your vision. One of the sulfur compounds in green onions is allyl sulfide, which is directly responsible for reducing your chances of developing colon cancer. Flavonoids in green onions additionally keep cancer away by stopping free radicals from causing damage to your cells. Cancer-fighting foods like green onions along with a healthy diet are the best way to prevent getting this horrible disease. Another thing the sulfur compounds in green onions can do is help you lower your blood sugar levels. Green onions increase insulin naturally. If your stomach is always acting tricky, adding more spring onions to your diet can help naturally quell the issue. They also contain a fair amount of fiber which serves to get your digestive system functioning better. Thanks to the sulfur and vitamin K in this vegetable, you will enjoy better blood circulation, which leads to better absorption of vitamin B1. Essentially, that means your stress levels will lower, giving you more energy and leaving you less exhausted. 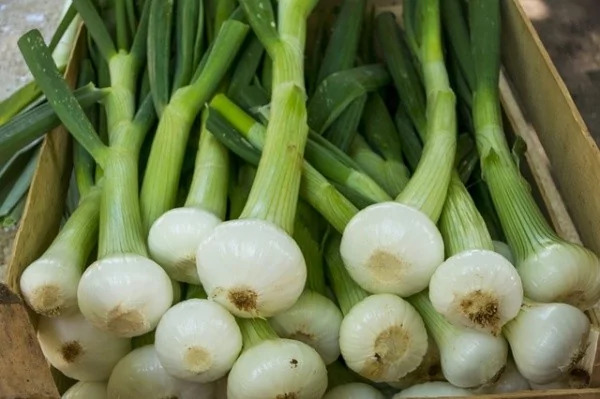 Vitamin C in green onions also serves to protect your body tissues from harm so when you are exposed to germs, you will be less likely to fall ill. Adding more spring onions to your meal plan will definitely bring tons of health and beauty perks into your life. Do you like to eat green onions? How do you like to use them in your meals? Feel free to tell us.